With my first-ever whitetail buck hanging in the shed, the next phase of the Idaho trip was to go for a first-ever steelhead. That effort was accomplished fishing by jet boat, back trolling with shrimp and lures on November 16th.. When his rod bent over, Monty graciously let me take over in my quest to land a steelhead. In the end, we hooked about eight fish, but only landed two. They were both hatchery fish, so we kept them. Couldn’t keep my eyes open for this photo. 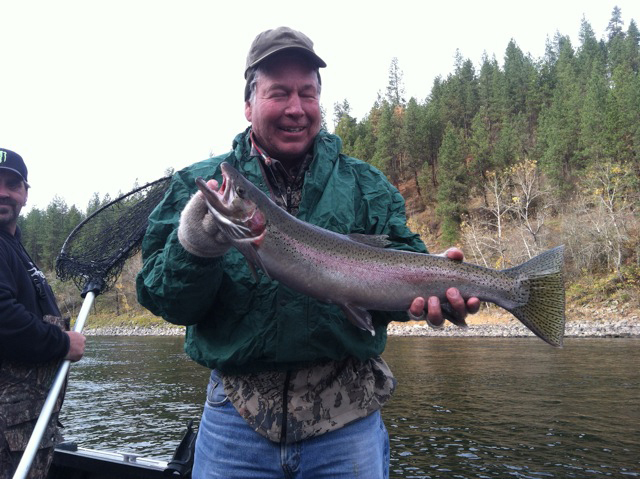 The Clearwater River is known for large steelhead, some over 20 pounds. It’s also where Lewis and Clark built boats and drifted in them downstream to the Pacific. Day two of my Idaho whitetail hunt started with a cup of coffee brewed by my host, Monty, at 5 AM. By 6:30 I was on the way to his tree stand. It’s a covered two-man tree stand – very roomy for one. I hung three scent wafers in bushes near the blind – tarsal gland scent. From my perch, I had a good view of a stand of timber, which was somewhat cleared of brush. My host and I had walked the area the day before, bumping four does and two fawns. Buck sign was not found, no scrapes or rubs. I enjoy stand hunting. My anticipation was high while waiting for a chance at my first ever whitetail. The wind was favorable, from my left to my right. The morning wore on and I could hear turkeys yelping off to my right and slightly up the hill. Squirrels joined in. “What are they squawking about,” I thought to myself, while wondering if the squirrel could smell me. The morning became mid-morning. At about 10:15 AM I looked into the woods and a single deer appeared. It was standing down the hill in the shadows facing me about 70 yards away – about as far as I could see before the hillside dropped off into brush. “Does it have horns?” I thought as I reached for my field glasses. Slowly raising my glasses, I focused on the deer. It took me a minute to find him in the shadows. I carefully placed the glasses back on top of my pack and got a good grip on my muzzleloader. “Can I get him in my sights,” I thought to myself, getting excited. Looking at the deer through the open sight, I considered a shot. When I drew the hammer back it produced a slight click. The buck’s eyes were riveted on my location – had he heard the click? Or, maybe he got a whiff of me. That would be worse. I sat and watched the buck and looked at him through the open sight. Another deer appeared in the shadows to my left of the buck. I reached for the glasses again. Doe. This was good. The buck was with a doe. I felt like my chances were improving. I fought off nervousness and told myself to stay calm. Then the doe turned and walked back down the hill. The buck turned, lowered his head and quickly followed the doe. I remained optimistic that they would return and after a few minutes, the buck appeared again, in almost the same spot as before. The doe and another deer also appeared in about the same spot they had stood previously. I looked at the buck through my sight again. I could shoot, but it wouldn’t be a perfect opportunity. I decided to wait for a better shot. The buck began to scratch his back – good. And then he reached down for a bite of something. He was comfortable. The doe took a couple steps and laid down. My excitement was rising. Again I reminded myself to stay calm, which somehow helped. The buck turned towards the doe and walked broadside towards her. I cocked the hammer again and followed the buck’s vital as he passed from tree to tree, never stopping in a spot where I had an open shot. Then he turned and walked back to nearly where he had stood previously. Once he stopped directly behind a tree. No shot. Then he turned again and circled before lying down. He was laying with his right front shoulder exposed to me. “Should I shoot him lying down,” I asked myself looking at his shoulder from about 60 yards. It was a very good opportunity. I couldn’t pass it up. I rested the “Bonecollector”muzzleloader on the cross-bar around the stand. Through the fiber-optic sight, I felt confidant. The rifle was steady. The buck was calm. I squeezed the trigger. BOOM. Smoke filled the air. In a moment it cleared enough to see he was down. No he was up and running, but he held his right leg high an indication of a good shot. Monty took this photo with his iphone. 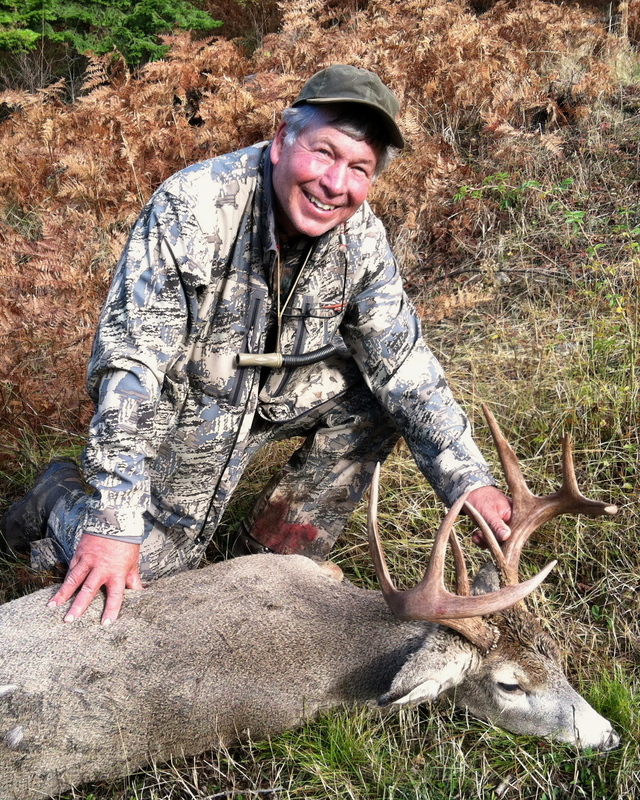 The buck is a fine whitetail -8 point Eastern count, heavy horns, very symmetrical antlers and long tines. My friend Monty joined me and we walked to the buck. The long wait for a whitetail buck was over and I was very pleased. Number 19 reservation at San Luis. Decided to take advantage of a good opportunity last Wednesday. Arrived in time to be the first at parking lot 1. Walked directly to a good spot on the horrible horseshoe. Fended off a couple guys with headlights so bright I thought they were driving into the marsh. Put out a couple decoys and set up in what appeared to be a good spot. About fifteen minutes before shooting time, I decided to grab some shells. Reached into my back pack and found – nothing. I rummaged around in my pack again and came up with two shells, left over from my previous trip. This is the type of beginning to a hunt that can drive a guy crazy. At least I had two shells. I considered going back to the truck, but if I did, I’d never find my decoys and I didn’t want to carry them out and back. Not only that, but a light fog was settling in making it even more unlikely that I’d ever find this spot again. I decided to make it a two shot hunt. Maybe I’d get a good crack at something, but you know how it is in the fog. Standing in tules, teal kept passing by in range, but I couldn’t get on them quick enough. And, with only two shells, I didn’t want to waste my chances on poor shots. After an hour of frustration and declining waterfowl activity, I gave up. Still had two shells. After reaching the car and grabbing additional shells, I decided to do some scouting. I even found a couple pheasants, but no place worth setting up for ducks. Turns out it just wasn’t a very good day at San Luis anyway. About 35 years ago, my brother and I were looking for a ranch. We had little money, but lots of time and energy. We heard about a property we might be able to buy at an affordable price. It was listed for sale with a real estate broker with whom I was acquainted. He explained the situation like this. Two brothers, Frankie and Al, had owned a ranch for many years. They had purchased it primarily as a hunting club. One of the brothers ran the business affairs and the other had made a hobby of making physical improvements like dams and roads. Over time they purchased additional property and the ranch grew to over 1,000 acres. In addition, it was adjacent to two land-locked sections of BLM ground – giving them almost 2,000 acres on which to hunt. The had it almost to themselves. They had also built a very nice home on the property and they invited family members to hunt. Some of their guests actually paid a fee which allowed them unaccompanied access to the ranch. Over the years, the brothers agreed that in their old age, they would sell the ranch if they needed money for retirement. Little did they know that Albert would drop dead from a heart attack at about the age of 50. Al was married and his portion of the ranch went to his wife. Having no other means to support herself, Albert’s wife asked Frank to purchase her interest in the property, or (at least) allow her to sell her half. Although Frank did not agree to purchase her half, he did agree to letting her subdivide and sell subject to Frank having a first right of refusal to purchase. Their agreement included a division of half the ranch into five 120 acre parcels. The parcels were put on the market for about $100,000 each with seller financing. As offers came in, Frank had the right to either match the offer or let Albert’s wife sell to the buyer. The price was acceptable, but nobody wanted to be the guinea pig for Frank. It became clear to us that the agent and Albert’s wife were frustrated by their inability to obtain a viable offer. My agreement with the seller’s agent was that we would split a 10% commission, but I couldn’t see making an offer just to watch Frank take the opportunity away from us. The $100,000 price was a little too rich for Rob and I to handle on our own, so we found a partner who would become co-owner if the deal came together. Then I got an idea that made a lot of sense. If the seller wanted to get the property sold, she might need to pay a higher commission. If she were willing to pay 20% and the selling agent was willing to accept 5%, we could pay me 15% even if Frank purchased the property. That would fund a pay out of 5% to me and each of my partners. Once I proposed this idea, my partners were a go. If Frank acted on the first right, we would each be compensated for our efforts. The seller’s agent and the seller were fine with idea. At this point we made our $100,000 offer and waited to hear from Frank. He acted upon the first right. There were four remaining parcels available and we still didn’t know exactly what to expect from Frank, so we made an offer that would repeat itself on each of the remaining parcels with a commission being paid to me (and indirectly my partners) each time Frank acted. Frank not only exercised his first right, but he became so annoyed that he outright purchased the remainder of the ranch. I received a commission of 15% on all five parcels. My partners and I were disappointed that we couldn’t own the property, but we were compensated for our disappointment. Some significant information can be gleaned from this story. First of all, it is clear that a first right of refusal has a negative impact on one’s ability to sell property. And, it is clear that the first right decreases the value of the property – in this case about ten percent. In my opinion the actual decrease in value was even higher than that.